This is a repost of an article I wrote in November 2013. Enjoy! In 1947, a woman named Frances Gerety coined the phrase “A Diamond is Forever” for DeBeers. She may have been right but for the Victorians, hair was more eternal (and affordable) than glittering gems. Mourning jewelry, or jewelry worn when one is mourning the loss of a loved one, has been around for centuries. But the Victorians truly embraced it when Queen Victoria took mourning to a new level in the 1800s. Last year, I wrote about how the death of her beloved Prince Albert initiated a very detailed code of dress for ladies. The Queen was partial to mourning jewelry, especially if it was made out of jet (which is not a true mineral but actually a very old form of decayed wood). 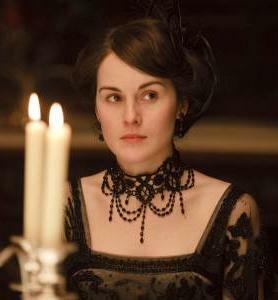 In the third season of PBS’ popular Downton Abbey, Lady Mary follows the dictates of society by wearing jet jewelry in her time of mourning for her late husband. Photo courtesy of PBS. 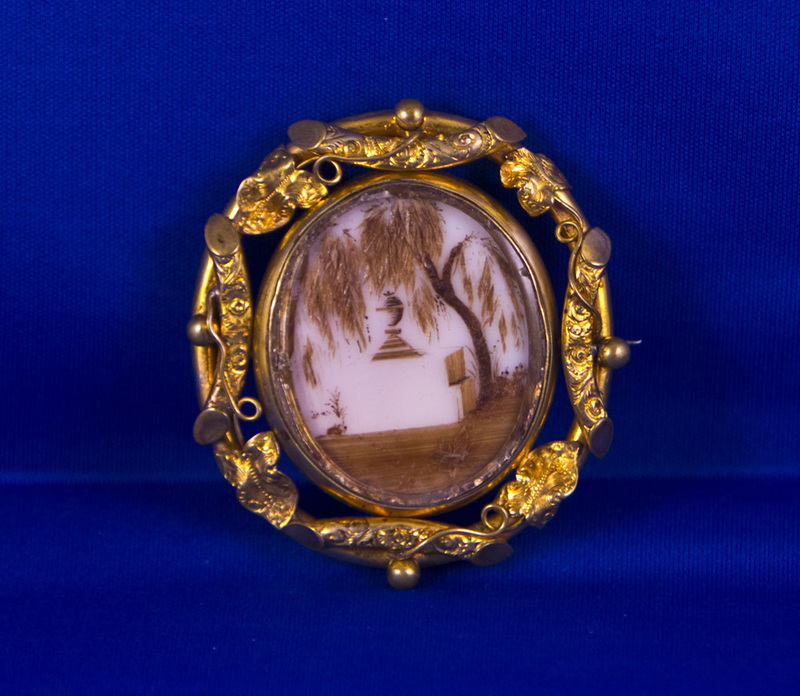 The curious practice of making mourning jewelry from human hair became very popular. In other words, jewelry that literally contains hair from the deceased. This might seem incredibly bizarre (and to some, downright creepy), but the act of keeping someone’s hair as a memento of them was quite normal. The hair could be placed in a locket or even in an elaborate piece of jewelry. 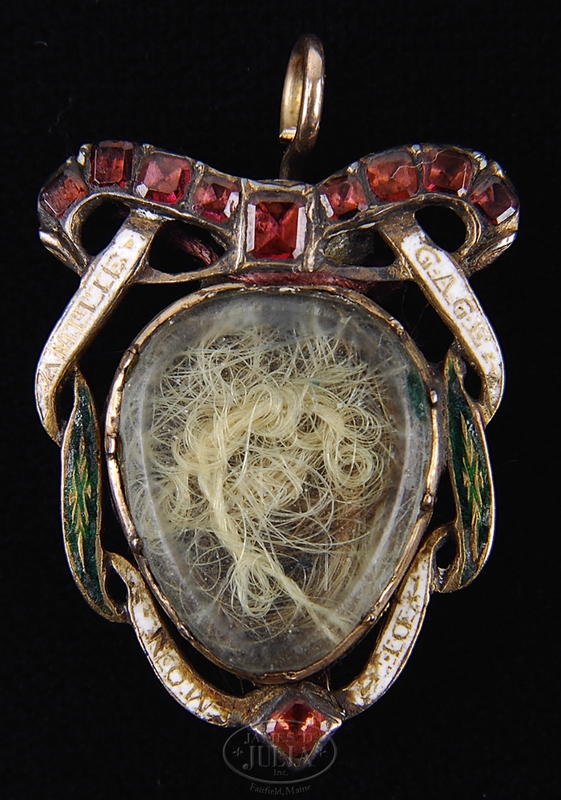 This 18th-century locket contains the hair of George and Martha Washington. It was sold at James D. Julia Auctions in August 5, 2009 for $7,475.00. Of course, not everyone could afford jewel-encrusted lockets like the one pictured above. More often, it was simply a lock of hair stashed behind a painted miniature or inside of a ring. The jewelry’s owner knew it was there but didn’t necessarily flaunt it. Since photography wasn’t fully utilized at that time, Victorians took to incorporating the hair of the deceased into their mourning jewelry. However, the Victorians took hair out of the darkness and into the light. Rings, pendants, pictures, wreaths, you name it and they did it. Located in Independence, Mo. (not far from Kansas City), Leila Cohoon operates the only hair museum in the U.S. to truly feature this art form. She says that often, a family member would collect hair from several generations of relatives and weave the hair into a wreath. More often than not, the wreath included intricate hair-woven flowers and were shaped like a horseshoe, always pointed up to keep luck in the family. 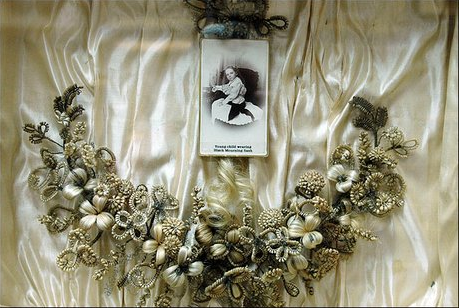 Her museum features hundreds of examples of hair art. You can find them up for bid on eBay from time to time as well. 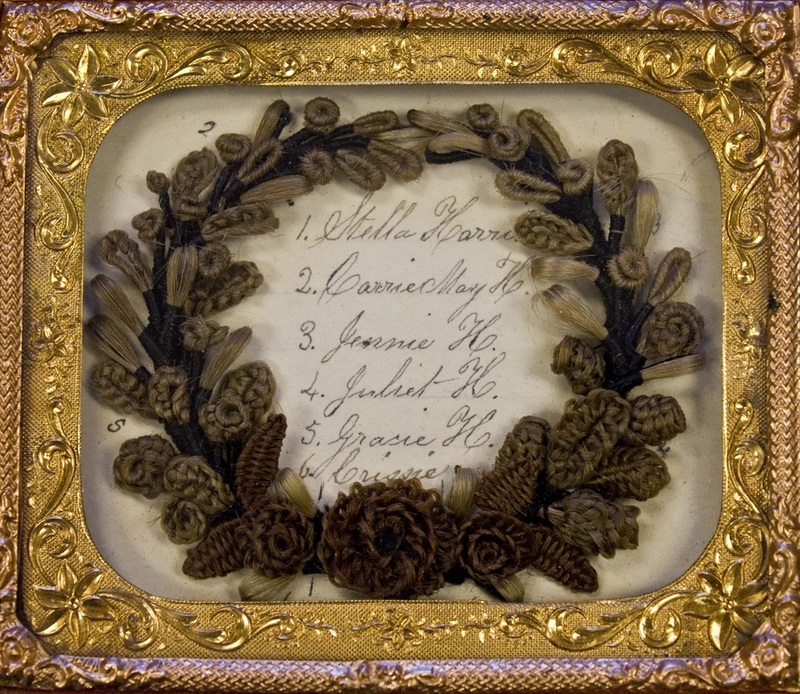 This framed wreath is made out of hair from the ladies listed inside of it. Photo courtesy of Leila’s Hair Museum. The Northampton Historic Museum and Education Center in Massachusetts has a fantastic virtual exhibit of Victorian hair art. They do a better job at explaining the history behind it than I can. 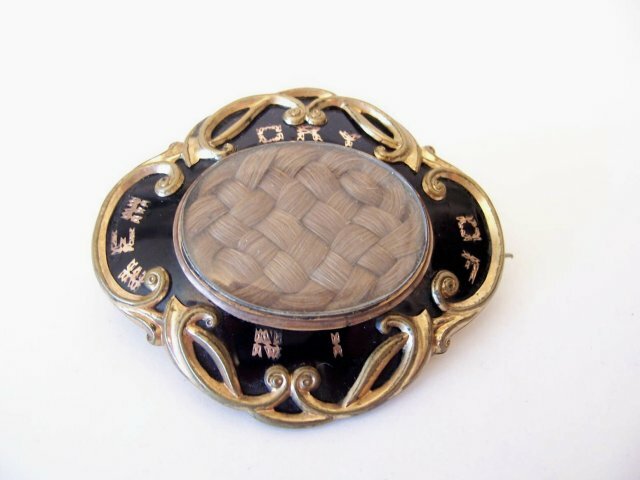 For mourning accessories, jewelry items made from the hair of a deceased friend or loved one became hugely popular. Pamphlets featuring hairworking patterns assisted Victorians with creating their own hair jewelry, if they so desired. The jewelry designs are surprisingly complex and varied for consisting of such humble material as human hair. The pieces could incorporate jet, gold and diamonds for later stages of mourning or lockets for hair or photographs. 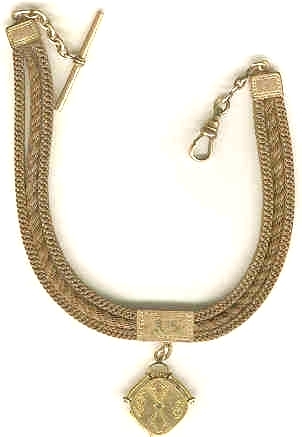 There was also a large market for mass-produced gold fittings that could be personalized with engraving or monograms, so the jewelry items could be commissioned as well. There was some distrust, however, of professional hairworkers; there was a widespread problem of hairworkers neglecting to use the deceased person’s hair. Instead, they would sell “custom-made” pieces actually made from purchased bulk hair. This is a gentleman’s watch chain made out of human hair. I can’t imagine how many hours it took. Looking at some of these examples, I have to wonder how on earth this was done. And how long it must have taken. Then it occurred to me that during the Victorian era especially, most gently bred women did not work. And if their children were grown or away at school, they had ample time on their hands. 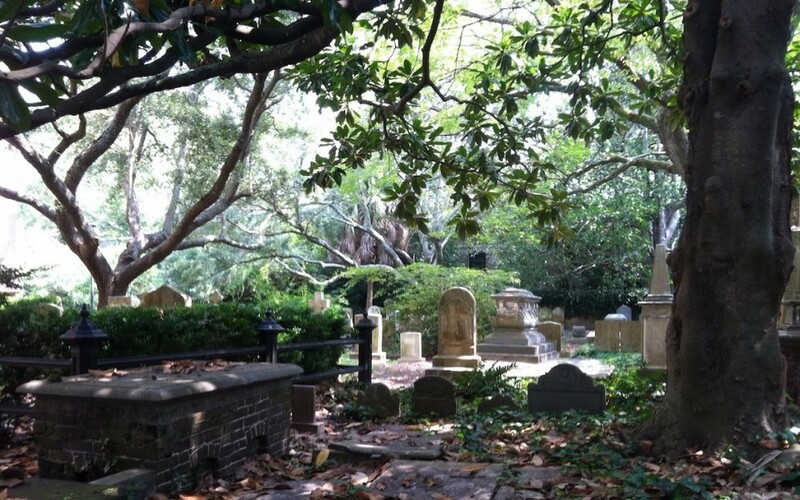 If they truly were in early mourning, they weren’t allowed to go out except to attend church services. 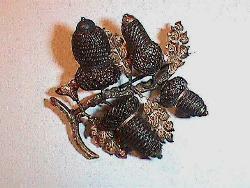 The acorn probably originated as an English hairwork motif since oak is England’s national wood. This brooch features four hair acorn shapes, which are tightly woven and incorporate gold components to support the acorn shape. Photo courtesy of the Historic Northampton Museum and Education Center. No doubt someone spent several hours creating this intricate brooch. Photo courtesy of Leila’s Hair Museum. Palette work is the most versatile of the techniques. It can make pictures and designs both large and small. The hair is used in a “cut and paste” manner to create designs. The third picture on this page is an example of palette work. Sepia painting uses the hair as a painting medium and spread thinly on the background. The sixth picture on this page is an example of palette work. Tablework is created using a table and bobbins with weights. The hair is woven around a form in order to make the shape desired. The fifth picture on the page is an eye-catching example of this style. 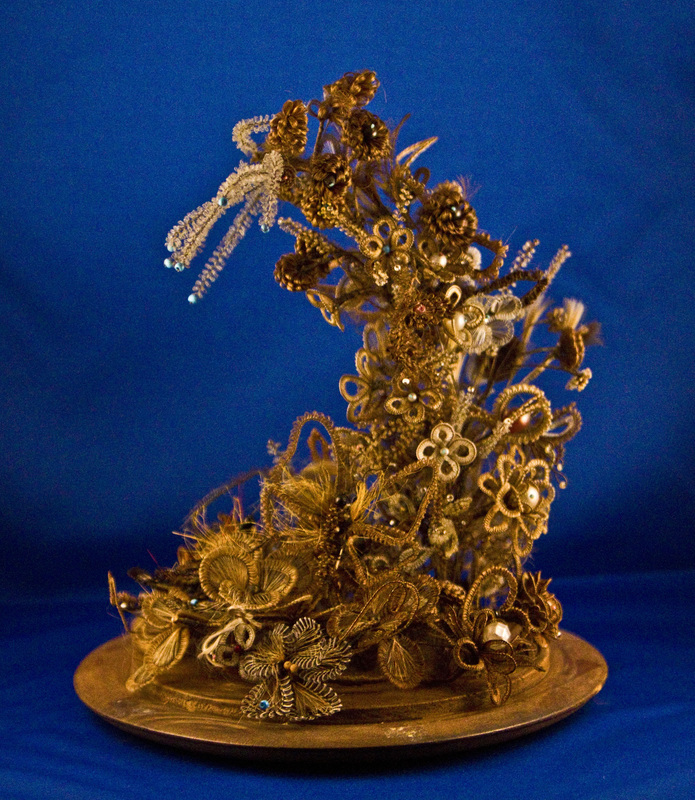 Hair flowers are created using much longer hair than is needed for the palette or sepia technique. The hair is wound around a rod and secured with a wire making long lengths of looped hair. The hair is then shaped into petals or leaves. When several are wired together a flower can be formed and many very large wreaths were made using the hair of many people. Sometimes a church would make one of all their members, or a family would make one of all the members of the family, these could get very large and ornate. The fourth picture on this page is an example. Then there are those works of art that aren’t jewelry and defy explanation. Photo courtesy of Leila’s Hair Museum. There are actually dozens of Pinterest pages devoted to the art form. Many artists like Sandra have revived the tradition and are selling their pieces online. In the end, while it does seem a tad freaky, the sentiment behind using hair for mourning jewelry makes sense. If you couldn’t have a photo of your loved one to put in your wallet or purse, wearing one of these pieces of jewelry could make you feel close to your deceased loved one in an intimate way. It would never fade or be destroyed by the ravages of time. As seen in the pictures featured here, many examples survive today. So maybe the Victorians were onto something after all. This shadow box with a picture of a girl in mourning is lined with material usually reserved for a coffin. The wreath is made with hair from the girl and the girl’s mother, who had died. Photo by Richard Gwinn.